You can take the butter, but we offer you the buffet. We'll help you more fully connect with your defining mission and purpose, and to structure a campaign that will accomplish mission-specific results. We'll help take your mission to the next level. We designed and managed major campaigns for Disney/Walden's Narnia, Warner Brother's Superman Returns, A&E's God or the Girl, Catholic Exchange's Champions of Faith, Gospel Music Channel, Fr. Larry Richard's The Reason for Our Hope Foundation. If your organization is Catholic and there's a great story to be told, let's talk about producing an award-winning, inspirational documentary that could be showcased to over 5 million through our partnerships. Last year we produced "The Newman Miracle Story," (click to view) which was featured on EWTN and CatholicTV. 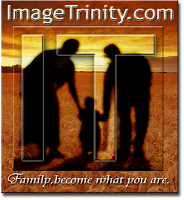 Through our non-profit, Image Trinity, we're wanting to launch a series called "Living IT!" Go here for the feature interview by ZENIT. Here are some examples of mission-specific videos. The Servants of Mary is a pilgrimage location in Ohio, home to the largest Our Lady of Guadalupe statue in North America. For St. Luke School (Erie) we developed a mission film and four commercials. We produced a number of videos to celebrate various events, including St. Mark Seminary's 50th Anniversary, the Catholic Diocese of Erie's 150th Anniversary, and Saint Mary's Home's 150th Anniversary. For St. George Parish (Erie) we developed "the personal side of faith at St. George" concept- including a custom website (SGWeBelieve.com) and personal-witness videos. What is IT all about? We invite families to join us in the great adventure of discovering our identity and living IT out. Through our love we Image the Trinity (get IT?). Even more, our love is a participation in the very life of the Trinity. We seek to celebrate and strengthen this identity/mission through an integration of dynamic programs, multimedia, web and retreat centers. Join us for our Made2Worship events the first Wednesday of every month. Bring a free-standing candle. Coming November, 2011 - our Presence for Christmas events will be broadcast throughout the world, inviting families around the world to join in the adventure. Climb the mountain. See the Big Picture.